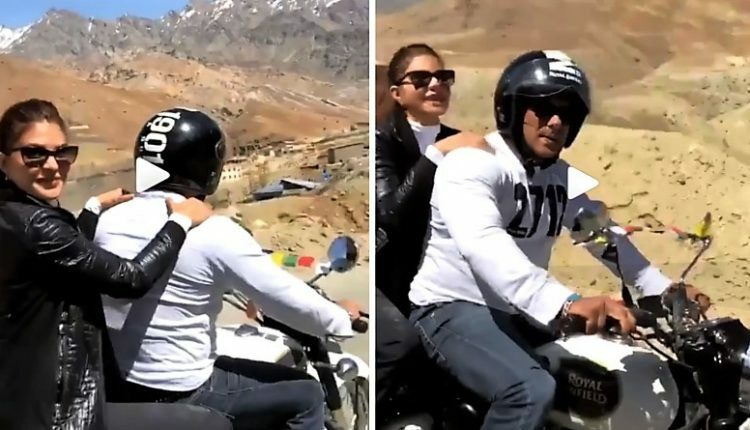 Salman Khan was recently spotted riding Royal Enfield Classic 350 in Leh with his Race 3 co-star Jacqueline Fernandez. As they were shooting for their upcoming film in Leh, Salman Khan could not resist leaving without a bike ride. Other than Classic 350, the crew was also seen riding Polaris ATV in Leh. The images seen here were clicked when they were returning from Kargil. The white Classic 350 was surrounded by fans at one place while Salman Khan used a Royal Enfield open face helmet for keeping safety high at all times. Jacqueline took a big risk by not wearing a helmet on such a tough road. Royal Enfield bikes are preferred more than anything else in this region for their tough guy engine and never dying body control. Long distance riders prefer these machines for their impressive all day running ability. Salman Khan is a motorcycle fan as he owns several impressive bikes like Hayabusa and Intruder M1800R. Classic 350 is their best selling product and scores more than 50,000 units every month. The bike is powered by a 346cc, air cooled engine producing 20 HP at 5250 rpm and 28 Nm at 4000 rpm. The engine comes with 5-speed gearbox.